On Tuesday, the United States face Belgium in the round of 16 at the 2014 FIFA World Cup. As it is, the U.S. is undefeated against Belgium in World Cup finals play…alas, with a 1-0-0 record. 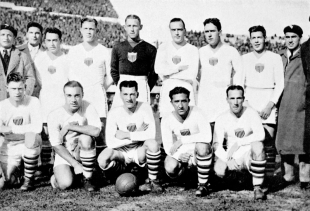 The Americans’ win came in 1930, during the inaugural World Cup in Uruguay. In what is hopefully a bit of foreshadowing, the U.S. went on to face Argentina after defeating Belgium (albeit with one match in between). If you are a frequent visitor to this site, you are no doubt familiar with Ed Farnsworth’s excellent series on the U.S. and the World Cup, including his account of the team’s performance in 1930 when the U.S. finished in third place. This piece is not going to rehash that which has already been so well-reported. Instead, we are going to go back to those days of yesteryear and enjoy the match in minute-by-minute form (or close to it). Even today, it is hard to imagine that the U.S. were one of the favorites to win the first World Cup. Of course, it should be recalled that most of the top European sides — and all of the United Kingdom — did not participate in the tournament. Nevertheless, France, Belgium, and Yugoslavia made the trip, and all of the top South American sides took part. Still, the U.S. were well-regarded, featuring a number of players from the American Soccer League, probably the most powerful domestic league in the world outside of the British Isles at the time. 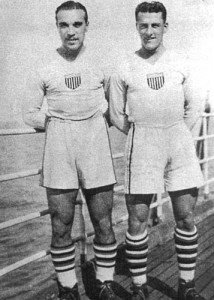 Jimmy Douglas of New York Nationals, a veteran of the 1924 Olympics, tended goal, and the midfield featured perennial ASL stars Andy Auld (Providence Gold Bugs) and Billy Gonsalves (Fall River Marksmen). The front line (which, of course, numbered 5 in the old W-M formation) included James Brown (New York Giants), Tom Florie (New Bedford Whalers), Bart McGhee (New York Nationals), Arnie Oliver (New Bedford Whalers), and Bert Patenaude (Fall River Marksmen). Then — as now — the Americans were praised for their size and strength. Nicknamed “shotputters” by the French press, this squad played the fast, physical game seen on the eastern seaboard of the U.S. Only two players (one a goalkeeper) hailed from the St. Louis leagues, notwithstanding that city’s reputation, even then, of being the hub of “American” soccer. The United States was placed in a group with Belgium and Paraguay. The Americans’ opening match was on Sunday, July 13, against Belgium. Belgium were a rather formidable side. The local Uruguayan papers described them as “a tremendous European soccer power,” and Wilfred Cummings, head of the U.S. delegation, stated plainly he would have preferred to see the U.S. open against Paraguay. While perhaps not a “tremendous” soccer power, the “Red Devils” were nevertheless a strong side. Belgium won the gold medal in the 1920 Olympics. In fact, one year earlier a squad of Belgian World War I veterans trounced a U.S. team of servicemen, 7-nil, in the Inter-Allied Games. The U.S., meanwhile, had played in a total of eight “A” internationals in its entire history prior to the World Cup. The Americans were also less-than-impressive in the 1924 Olympics. Still, this was a U.S. squad of seasoned pros, toiling in the ASL. Anything could happen. Patenaude took the tap for the Americans, passing it to Florie — who promptly turned the ball over. The Belgians quickly countered, and forced a corner kick about 30 seconds in. The U.S. survived that first sortie, and then traded blows with the Belgians for the next 15 minutes. The Belgians had the better of play, attacking “with lots of impetus” according to press reports. The Red Devils were also employing a very effective offside trap, with Florie the usual victim. The Belgians continued to “carry out very dangerous attacks,” according to reporters, and on several occasions had Jimmy Douglas beaten only to scuff shots over the bar. The Americans were also prone to missing sitters — Patenaude weaved his way through the Belgian defense, only to shoot wide, and a charging Gonsalves hammered a rocket wide of the goal. Having survived the Belgian attack for the first quarter hour, the U.S. began to settle into the match. Belgium continued to press, but were stymied by the American midfield. About 20 minutes in, Patenaude again penetrated the Belgian penalty area, where he was fouled by defender Theodore Nouwens. However, no foul was called by Argentinian referee Jose Macias, for whom such assaults in the thuggish Argentinian leagues were daily gruel. Inspired, the U.S. begin to attack in waves, and Patenaude and Gonsalves again missed clear opportunities. In everyone’s defense, the pitch was described as simply awful. In the 23rd minute, Gallagher won the ball. Feigning a pass to Patenaude, Gallagher instead sprayed the ball wide to Gonsalves. Gonsalves unleashed a cannon of a shot just beyond the outstretched hands of the Belgian keeper — only for the ball to hit the crossbar. However, waiting for the rebound is Bart McGhee, who slotted the ball away to give the U.S. a 1-0 lead. After the restart, Belgium continued to dominate possession, but also continued to be too cute with the ball, passing up clear shots and ultimately being dispossessed. With the half nearing a close, American fitness began to carry the day. The U.S. attacks increased, with the Belgians defending their goal desperately. In the 43rd minute, midfielder Rafe Tracey launched a ball into the penalty area to a waiting front three of Gonsalves, Patenaude, and Florie. The Belgians didn’t budge, again employing the trap. Florie ran untouched onto the ball and fired from 10 yards out, giving the U.S. a second goal. By all contemporary accounts, all three Americans were in an offside position. The referee saw it differently, and pointed to the center spot. 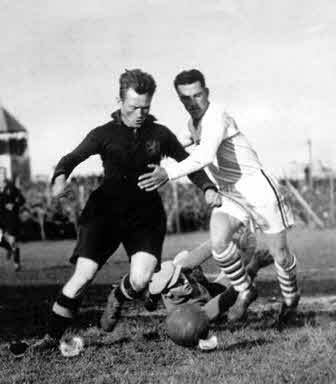 Bert Patenaude (in white), against Belgium defender Nicholas Hoydonck. Patenaude would score the first hat trick in World Cup history four days later in a 3-0 victory over Paraguay. Down two goals, Belgium came out firing on all cylinders in the second half. Again, however, deep penetration into the American end met with little result, with shots going wide or easily handled by Douglas. Perhaps chastened by his missed offside call, the referee was much stricter with foul calls and offside in the early minutes of the second half. In the 69th minute, Brown received a pass from Gonsalves and made a winding run towards the end line. Faced by a charging defender, Brown lofted a chip that cleared the head of an exposed Belgian keeper and landed at the feet of a waiting Patenaude, who scored easily to make it 3-0 to the US. At the 70 minute mark, it began to pour, the rain worsening the already bad field conditions. This likely played to the Americans’ advantage, as many of the players slogged through many heavy fields during northeast winters in the ASL. By the 85th minute, much of the crowd has left the game, drenched by the rain, the result not in doubt. With the final whistle, Jimmy Douglas recorded the first shutout in World Cup history. Four days later, the U.S. drubbed Paraguay by an identical 3-0 scoreline — Patenaude scored all three goals, netting the first World Cup hat trick. With two wins in the group, the U.S. advanced to the semifinal against Argentina. Rather than report on that match, however, we shall save it for a piece before the U.S. quarterfinal appearance against Argentina on July 5.